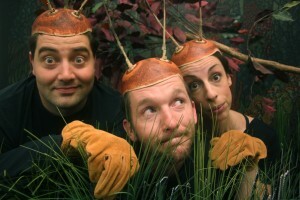 The hit show Honest Aesop’s Fables returns to Toronto after a sold-out FringeKids! run last year. It earned NNNN’s from NOW Magazine, and mentions for Outstanding Production, Ensemble and Design. This modern retelling of some of Aesop’s most famous stories features music, commedia, and a magical set. If you couldn’t get a ticket last year, don’t miss this limited engagement! Honest Aesop’s Fables runs July 16-19 at the Palmerston Library Theatre in repertory with A Midsummer Night’s Dream… A Puppet Epic! from Shakey Shake and Friends! For children aged 4 to 104. For a full review from NOW Magazine, click here. My small son wanted to talk about what he saw, and what he thought and felt about what he saw, all the way home. Then he wanted to re-read the original stories, so we could figure out, and discuss, how what we saw was different than the ones we had read. As a parent, those two things are my kids-theatre dream, and they make Honest Aesop’s Fables aces in my book. For a full review from Mooney on Theatre, click here.